First off, I felt it was warm enough to paint the front door last week. I got the paint last fall, but it always seemed too cold to leave the door open for a whole day, so I put it off. 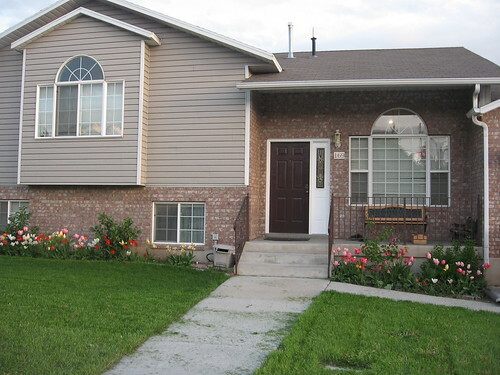 I really like the way it looks, and I also painted the white frame around the door as well, since paint was peeling on it. Now the railing needs a coat of paint too, but I will get around to that later. Also, last spring, we got more bulbs from the local park. They plant all new bulbs every year and just let the public come and pick them up when they get pulled out. So, I went one morning and grabbed a bunch and planted them. Of course, I didn't know what they would look like, but I think they look really nice in my yard. Also, they all don't bloom at the same time, so I had red and yellow ones in bloom earlier, now there are a bunch of pink, darker pink, orange, white, and yellow ones in bloom now. The fifth graders from all around Utah County and even some from SLC, all participated in a program called Hope of America last week. 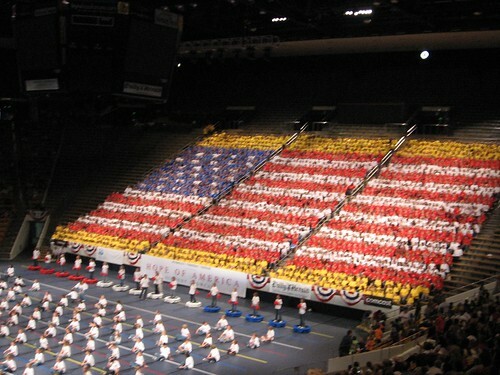 They split it into 2 days this year because there were 8000 kids participating. There were dances, videos, the chorus of 5th graders, and a pre-show to entertain us. It was really big and we had fun. Valerie was wearing yellow, and was in the first row above the blue row of kids. We found where she was sitting because she had her sunglasses tucked in the collar of her shirt and I could see them from where we were sitting. For the last month, Valerie and Scarlett were taking a pottery class where they were able to learn wheel turned pottery and other skills. They made a bunch of pieces and I'm supposed to pick them up tomorrow if I remember. Maybe I will post a picture of all their work when I get them. The class was put on by the Scera Arts Council and there was an Art show of all the kids taking drawing, painting and pottery. 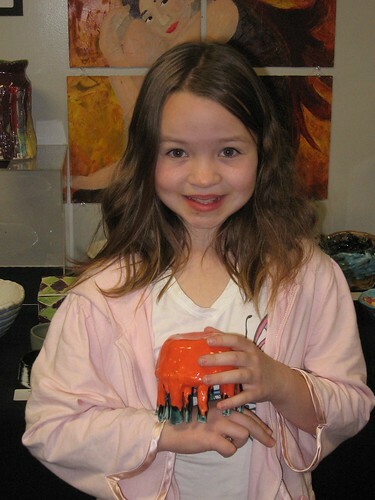 It was fun to go and see what other kids did as well as see our own artists. The girls also had some art at a school art show last week as well. 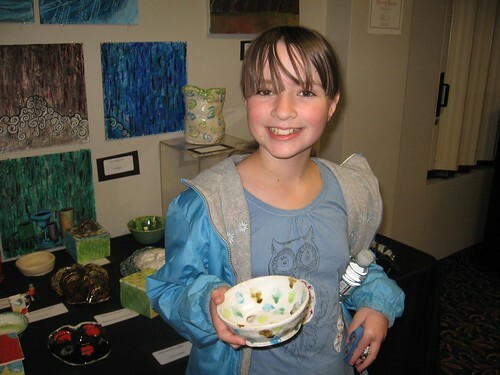 Valerie and Ella brought some pottery pieces they made at different classes and Scarlett had a painting she did at school exhibited there. There were different craft projects for the kids to do also, and the kids had fun doing the crafts. I love the color choice for your door! It looks great! 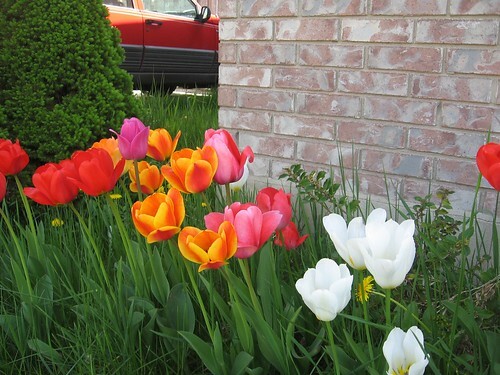 I love all your tulips! You have so many pretty ones!